PROTO5533 presents the ways we stand by with Sirma Doruk, Alexandra R Howland, Miriam Katz, Hasan Ozgur Top, curated by Nicole O’Rourke, which looks at how we, as individuals, have changed both our behavior and our reactions in the age of the internet. Miriam Katz’s video, ‘Extra Ordinary,’ 2015, is a compilation of short videos with actors saying quips like, “I hate Twitter” or “I’m starving.” The video loop comically displays our inherent selfishness, our false sense of importance in the internet era, and our inescapable urge to make everything personal while also saying nothing at all. Sirma Doruk’s three channel video titled ‘Social Interface,’ 2015, is a text-based work. With an audio component that sounds alike to hasty typing, the three videos together reflect our current state of approval, or the current state of how we treat news and facts versus opinions based in internet and computer relevant terminology. It is about the ways we quickly and thoughtlessly behave online—invisibly and without responsibility. 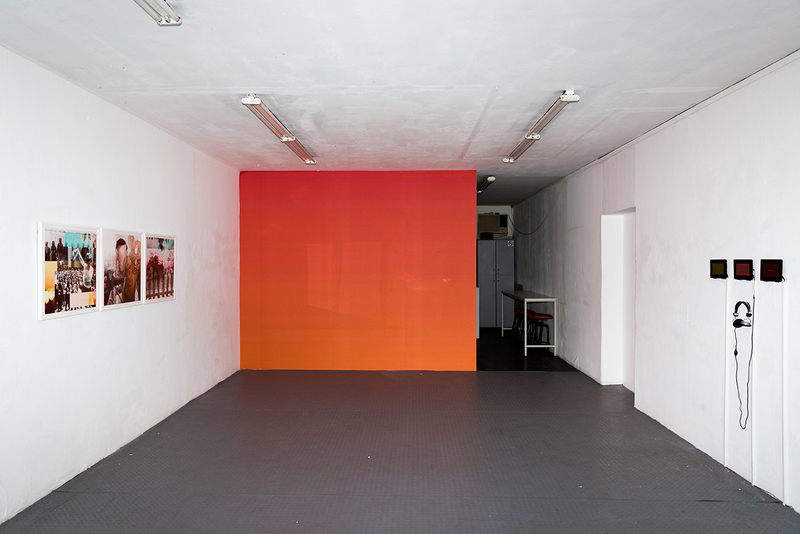 Hasan Ozgur Top’s digital print on wallpaper, ‘From Guantanamo to Ar-Raqqah,’ 2015, is of two different shades of orange, one taken from an online image of a Guantanamo Bay prisoners’ suit and the other from the t-shirt of an American prisoner who was killed by ISIS in a video that was released online. The wallpaper represents the ways we internalize the images of horror we see online, how what we see becomes an abstract wallpaper in our subconscious, ready for associative meaning in the real world. Alexandra R Howland’s digital photo-collages speak to the ways we select and choose what we see online, mediated by our own social media pages or google searches, ultimately creating our own false collage of the real world. The internet has changed us, our language. We stand by* as we see a deluge of images and news, we choose and select, we copy, we paste, we curate our lives online. We are all bystanders. *stand by: (phrasal verb of stand) – 1: be present while something bad is happening but fail to take any action to stop it. 2: support or remain loyal to (someone), typically in a time of need. Special Thanks to Mari Spirito, Anthony Huberman, Anne Ellegood, Francois Quintin, Ovul Durmusoglu, Yasmil Raymond, Mehmet Kahraman, Helene Dumenil, Robbie Lee Valentine, Özlem Sakin, Volkan Kaya and the Rampa Gallery Team. Nicole O’Rourke is a New York-born Istanbul-based writer and curator. She is an MA candidate in Art History at Hunter College in New York. She has been published in Time Out, Istanbul Art News, Dazed and Confused, Exhibist, The Guide Istanbul, artspace.com, Near East Magazine, and Twin, among others. She currently works at Rampa Gallery, Istanbul. Proto5533 presents exhibitions by emerging artists and curators, with guidance from art professionals, mentor curators, from Istanbul and abroad. Proto5533 is a collaboration by Protocinema, an itinerant, site-aware art organization, protocinema.org, and 5533, an artist run space, imc5533.blogspot.com.tr, bringing together an active generation and providing the relationships and tools to nurture its meaningful growth. Selected Curators: Naz Cuguoğlu, Kevser Güler, Mehmet Kahraman, Ghaith Mofeed, Nicole O’Rourke, Ilhan Ozan, Ulya Soley. Mentor Curators: Celenk Bafra, Curator, Istanbul Modern, Istanbul; Anne Ellegood, Senior Curator, Hammer Museum, Los Angeles; Övül Durmusoğlu, Independent Curator Berlin/Istanbul; Anthony Huberman, Chief Curator, Wattis ICA, San Francisco; November Paynter, Associate Director of Research and Programs, SALT; Yasmil Raymond, Associate Curator, Museum of Modern Art, New York; Mari Spirito, Director, Protocinema, Istanbul/New York; François Quintin, Director Fondation d’entreprise Galeries Lafayette, Paris.